What is it? It is a matter of intense debate among Marxists. There are various interpretations. Crises of capitalist production are due ‘underconsumption’, a lack of spending by workers who do not have enough to spend; or due to ‘disproportion’, the anarchy of capitalist production means that production in various sectors can get out of line with others and production can just outstrip demand; or it’s the lack of profitability in an economic system that depends on profit being made for private owners in order for investment and production to take place. In my view, the latter argument is the one that is both the best interpretation of Marx’s theory and also the one that is logical and fits the facts. Some argue that Marx did not have a coherent theory of economic crises, and that was especially the case with Marx’s law of profitability. The argument goes that a reading of Marx’s works: Capital, Theories of Surplus Value and the Grundrisse, shows that Marx’s law of the tendency of the rate of profit to fall is inconsistent and illogical. For example, the law argues that the value of means of production (machinery, offices and other equipment) will, over time, rise relative to the value of labour power (the cost of employing a labour force) – a rising organic composition of capital, Marx called it. As value (and profit) is only created by the power of labour, then the value produced by labour power will, over time, decline relative to the cost of investing in means of production and labour power. The rate of profit will tend to fall. But some Marxist critics say that this assumes that rate of surplus value (profit relative to the cost of employing labour power) will be static or rise less than the organic composition of capital. And there is no logical reason to assume this – indeed, the very rise in the organic composition will involve a rise in the rate of surplus value (to raise productivity), so the law is really indeterminate. We don’t know whether it will lead to a fall or a rise in the rate of profit. But this is to misunderstand the law and how Marx posed it. The law ‘as such’ is that a rising organic composition of capital will rise and, assuming the rate of surplus value is static, the rate of profit will fall. But this is only a ‘tendency’ because there are ‘ countertendencies’, including a rising rate of surplus value, the cheapening of the value of means of production, wages being forced below the value of the labour power, foreign trade and fictitious profits from financial speculation. But these are ‘countertendencies’, not part of the ‘law as such’ precisely because they will not overcome the law (the tendency) over time. Marx argues that the law is based on two realistic assumptions: 1) the law of value operates, namely that value (and surplus-value) is only created by living labour and 2) capitalist accumulation leads to a rising organic composition of capital. These assumptions (or ‘priors’ in modern statistical language) are not only realistic: they are self-evident. First, the law of value. The production of what Marx called ‘use values’ (things and services we need) is necessary to create value. But even a child can see that nothing is produced unless living labour acts. “Every child knows a nation which ceased to work, I will not say for a year, but even for a few weeks, would perish.”, Marx to Kugelmann July 11, 1868. The rising organic composition of capital is also self-evident. From hand tools to factories, machinery, space stations, there is a huge increase in labour productivity under capitalism as a result of mechanisation. Yes that creates new jobs for living labour but it is essentially a labour-shedding process. While each unit of a new means of production might contain less value (due to the lower price of production of that technology) than a unit of an older means of production, usually the old is replaced by new and different means of production, or by a new system of means of production that contains more total value than the value of the means of production they have replaced. As Marx explains in the Grundrisse: “What becomes cheaper is the individual machine and its component parts, but a system of machinery also develops; the tool is not simply replaced by a single machine but by a whole system… Despite the cheapening of individual elements, the price of the whole aggregate increases enormously”. As Marx put it: ‘It would be possible to write quite a history of the inventions made since 1830, for the sole purpose of supplying capital with weapons against the revolts of the working class.’ (Marx, 1967a, p. 436). Higher productivity is not the aim of capitalist investment; it is higher profit. And to achieve that, capital needs higher productivity and labour-shedding new means of production. Was Marx right that capitalist investment leads to a higher organic composition of capital over time? He sure was. Look at this graph. It shows a steady rise in the value of means of production (machinery etc) relative to the value of labour (measured in labour time) in the US since 1947. It also shows rising productivity (the labour time taken to produce one unit of things or services – LT). This is for the UK since 1855, as measured by Esteban Maito). So we have a rising organic composition of capital (VKxH) and a rising productivity of labour (falling LT) and a decline in the rate of profit over time (ROP). This is Marx’s law as such. There are counter-tendencies but they do not overcome the tendency, the law as such, indefinitely. Why? Well, first, there is a limit to the rate of surplus value (24 hours) and there is no limit to the expansion of the organic composition of capital. Second, there is a ‘social limit’ to a rise in the rate of surplus value, namely labour (workers’ struggles) and society (social legislation and custom) set a minimum ‘social’ living standard and hours of work etc. This is the essence of class struggle under capitalism. Did Marx drop his law of profitability as a theory of crises? In a letter to Engels as late as 1868, over ten years after he first developed the law, Marx said that the law “was one of the greatest triumphs over the asses bridge of all previous economics”.? But many Marxist critics reckon that Marx dropped this law as relevant as he did not seem to refer to the law after he expounded it in the late 1860s and looked more at the role of credit in crises (as Keynes and modern heterodox economists now do). Moreover, Engels, in editing Marx’s manuscripts after his death into Volumes 2 and 3 of Capital, made far too much of Marx’s law; indeed distorting Marx’s views on this. Back in 1978, Jerrold Seigel had a look at the manuscripts. Yes, Engels made significant editorial changes to Marx’s writing on the law as in capital Volume 3. He divided it into three chapters 13-15; 13 was ‘the law’; 14 was ‘counteracting influences’ and 15 described the ‘internal contradictions’ (the combination of the tendency and countertendencies). Engels shifted some of the text into Chapter 13 on the ‘law as such’ when in Marx’s manuscript they came after the counteracting factors in Chapter 14. But in doing so, Engels does not overemphasise the importance of the law – on the contrary, Engels actually makes it appear that Marx balances the countertendencies in equal measure with the law as such, when the original order of the text reemphasises the law after talking about counter-influences. So, as Seigel puts it: “Engels made Marx’s confidence in the actual operation of the profit law seem weaker than Marx’s manuscript indicates it to be.” (Seigel, Marx’s Fate: The Shape of a Life, Princeton, Princeton University Press, 1978, p339 and note 26). From 1870, Engels had moved from Manchester to London. So Marx and he met together as a matter of routine, usually daily. Discussions could go on into the small hours. Marx’s house lay little more than 10 minutes walk away … and there was always the Mother Redcap or the Grafton Arms. As late as 1875, Marx was playing with calculations of the rate of surplus value and the rate of profit. If Marx had really dropped the law as his most important contribution to understanding the contradictions of capitalism, would he not have mentioned it to Engels? In the second part of this blog post, I shall look at the empirical support for Marx’s law of profitability as a theory of crises under capitalism. This entry was posted on December 27, 2015 at 3:57 pm and is filed under capitalism, economics, marxism, Profitability. You can follow any responses to this entry through the RSS 2.0 feed. You can leave a response, or trackback from your own site. That’s very good, Michael; particularly nice to “rescue” Engels from the malign evaluations of Heinrich and others. But…. you don’t really answer the question you pose at the very beginning: what is Marx’s “theory of capitalist crisis”? And the whole subset of questions that follows from establishing that Marx does indeed such a theory: is the law of the tendency of the rate of profit to fall part of that theory of crisis? is the law the determinant of the theory? how does Marx’s theory of crisis differ from other theories? Who cares if Marx had a complete theory or not. Take a look away from your books and you will see the level at which the working class are struggling. At least Marx gives us the tools to analyse more than economists have given us. “.. This (graph above) is Marx’s law as such. There are counter-tendencies but they do not overcome the tendency, the law as such, indefinitely. Why? Well, first, there is a limit to the rate of surplus value (24 hours) and there is no limit to the expansion of the organic composition of capital. Second, there is a ‘social limit’ to a rise in the rate of surplus value, namely labour (workers’ struggles) and society (social legislation and custom) set a minimum ‘social’ living standard and hours of work etc. This is the essence of class struggle under capitalism.” – Why does Michael Roberts categorically assert that there is a social limit (i.e., finite, as national, in its own day clock) of variable-labour-power of surplus value – but that there is, simultaneously running, an infinite potential for the expansion of the global (multi-national), organic composition of capital? If variable labour-power-surplus value itself is an essential part of the organic composition of capital as a whole, then we might ask: how can OCC exist as an infinite, even if notionally, if an essential part of its being, is itself finite? Very good question. The limits to the increases in the organic composition of capital are embedded in, and in fact are identical with, the limits to the accumulation process itself. The accumulation of capital always involves accumulation of the means of production as values, as objectified labor. There is no absolute limit, as in, “once the organic composition reaches X percent, once the means of production represent X value, capital has reached its limit once and forever,” just as there is no absolute transcendent level of surplus value extraction, as in “once the rate of surplus value extraction exceeds X, capital has overcome its limit once and forever,” as that surplus value will inevitably be converted into greater capital values in the means of production. There is a “recurring” limit in that the accumulation of the means of production as capital tends to drive down the rate of profit and leads to conditions, moments, periods, when accumulation slows– i.e. the rate of conversion of surplus value into the means of production declines; investment drops; markets contract, and…the bourgeoisie in order to “restore” profitability must a)drive the cost of labor power below its value, i.e drive the wage below what is necessary for the reproduction of the laborers and b) devalue the means of production by any and all means, including their physical liquidation. I think exploration of your question is vital to understanding the very precise and “limited” meaning Marx intended by “crisis” and that Marx’s critique is not itself a “crisis theory”– as in “Capital enters a state of permanent, or continuous crisis.” Marx’s critique takes us to the point where “economics” is revealed to be, and supplanted by, class struggle. Not so. There are only 24 hours in a day, and for any concrete labour it can only work those 24 hours, but value and surplus value is measured in abstract labour-time, not the labour-time of some particular type of concrete labour. Marx points out in Capital I, that an hour of labour of say a carpenter may be equal to two hours of abstract labour. In that case, for a carpenter, there are 24 hours in a day, but if s/he worked for 24 hours, they would produce 48 hours of value. If they only required 4 hours of abstract labour to reproduce their labour-power, they would produce 44 hours of surplus value in a single day! Moreover, Marx points out that because labour in one country is more productive than in another, because for example, British workers had more and better machines to work with, the law of value is modified on an international scale so that in Marx’s example, an hour of labour by a British worker produces more value than that of an Austrian worker. That is why, Marx says, although British workers wages were 50% higher than the wages of European workers, and British working conditions better, the british workers produced more surplus value, and the rate of profit was higher in Britain than in European industries of the same kind. But, in fact, as Marx sets out, one of the main drivers for the rising organic composition of capital, which lies behind the Law of Falling Profits, is precisely the need to reduce wages that have risen as a result of accumulation on the old basis. It is the investment in new forms of labour saving technology that then causes the rise in the technical composition of capital, which results in a rise in the OCC, as social productivity rises, which in turn leads to the LTPRF as one of the means of resolving the crisis of overproduction. The higher social productivity resulting from this investment in new forms of technology, not only creates a relative surplus population, which reduces wages, but also causes ultimately a significant moral depreciation of existing fixed capital, and then also of circulating constant capital, so that what starts out as a condition LTRPF, which reduces the rate of profit to resolve the crisis, turns into the basis of increasing the rate of profit, as set out in Capital III, Chapter 15. Moreover, its false to state that it is workers struggles that act as a constraint here. Rising productivity means that the rate of surplus value, and rate of profit may be rising, whilst the potential for rising living standards increase along with it, precisely because of rising levels of productivity that reduce the value of wage goods. That indeed is the process marx discusses in the Grundrisse and elsewhere in relation to the Civilising Mission of Capital. It is also discussed by Engels, in his later prefaces to the Condition of the Working Class. That was the basis of Fordism, and of the proposals of Bismark for National Insurance and a welfare state, of Churchill in 1909 for the introduction of a Minimum Wage, and of Chamberlain in the 1920’s for the introduction of a welfare state. The idea that rising workers living standards are somehow inimical to capitalism is the theory of Lassalle not Marx. In fact, as Marx sets out in the Grundrisse in relation to the “Civilising Mission of capital”, rising living standards for workers are essential to Capitalism, because it requires a continually expanding market for new types of use values to be sold into, and along with it a continually expanding complexity and richness of the worker in terms of their abilities. 24 hours (or any time period) is an absolute upper limit to the extraction of surplus value. It doesn’t imply there is an upper limit to the rate of surplus value, even less so when skilled labour as a multiplier of simple labour is added to the picture. There is another point here, which Marx deals with also in Theories of Surplus Value Part 1. For any one worker there is only 24 hours in a day, but the social working-day is comprised of the working-day of millions of workers, and if the number of workers employed rises, the social working day rises, and consequently, the potential surplus value rises. c 1000 + v 1000 + s 1000. s’ = 100%, r’ = 50%. c 1500 + v 1500 + s 1500. s’ 100%, r’ 50%. Indeed, it is this fact that leads to a gradual using up of the existing reserves of labour-power, so that in the end wages are raised, causing the rate of surplus value to fall, which leads to crises of overproduction, i.e. the opposite to the conditions of the LTPRF. c 1600 + v 1400 + s 1400. s’ = 100%, r’ = 0.47%. c 5000 + v 2500 + s 2500. s’ = 100%, r’ = 33.3%. c 7000 + v 3000 + s 3000. s’ = 100%, r’ 30%. c 500 + v 2000 + s 2000. s’ = 100%, r’ = 80%. Average rate of profit, then equals 45%, which represents a rise in the average rate of profit for the economy of 36%, as a consequence both of an accumulation of capital, and rising occ. Assume a further iteration, with rising occ in Industry 2, and with Industry 1 surplus value again being accumulated in industry 2.
c 1800 + v 5200 + s 5200. s’ – 100%, r’ = 74%. Now, the rate of profit in Industry 1, is constant (because there is no accumulation, and no change in its occ), whilst the rate of profit in Industry 2 falls from 80% to 74%, as a result of accumulation and rising productivity. But, the average rate of profit is now 53%, for the economy as a whole, compared to just 45%, in the previous iteration. that is because accumulation has occurred in the new industry, where the rate of profit is higher. That is, in fact, what history demonstrates does happen, that accumulation occurs faster in these newer, higher profit areas, and slows down or stops in the older, lower profit areas. That is in fact, the importance of the Law of falling profits for establishing an average rate of profit, and shifting capital towards these higher profit areas. In order to get the LTPRF to do what is claimed you have to posit the capitalist system as something which it is not, and which it could never be. That is you have to posit it as a closed system, in which accumulation only ever occurs in a set of existing industries, and that no new industries, with higher rates of profit are ever created! Of course if this were the case PERMANENTLY, then the law of the tendency of the rate of profit to fall would not in fact even be a tendency, much less a law. It is a countervailing force, which only under certain precise conditions arrests the fall in the rate of profit. 2. and in particular it has declined since 1970 (I am most familiar with the US, but certainly Michael and others have demonstrated this decline on a greater global scale) and all the “new” have a)not been sufficient to reverse the decline on a sustained basis b) have at no time in their operation since 1970 propelled the rate of profit to a level ABOVE that of the peak established in that time c) have in fact been subject to the same exact dynamics expressed and manifested throughout capitalism historically– the conversion of surplus value into proportionately greater capital values in the means of production; the proportionately greater reduction of living labor required in the production process leading to d) the subsequent reassertion of the tendency of the rate of profit to decline. Boffy thinks he can get away with quoting, and misquoting, and misapplying Marx’s critique– without ever having to provide a single shred of historical evidence for his claims from the actual data available regarding growth of fixed assets, proportion of “v” in production, rates of profit, and rates of growth in the overall capitalist economy. Nonsense. You don’t have to do anything of the sort. You just have to pay attention to the material world; the actual course of, and perturbations in the course of, capitalist development, as opposed to the gobbledy-gook from the oracle of the spring-summer-late summer-early fall-fall-winter of long-wave cycles, super-cycles, and spin-cycles. I should have expanded on the point about their being no limit to the expansion of the rate of surplus value, as you had highlighted. For the economy as a whole, what is important, as Marx describes is the social working day, i.e. essentially we treat the whole working-class as a single worker. In that case if the normal working-day is 10 hours, and there are 10 million workers, the social working-day is 100 million hours (as you say even if we ignore whether some of the labour of these workers is complex rather than simple labour). In that case, the social working day can rise or fall not just because the length of the normal working day increases or decreases, but because more or fewer workers are employed. This is actually tied also to Marx’s discussion in Theories of Surplus Value of Ricardo’s correct point as against Smith about the importance of the net product as against the gross product. If we assume the normal working day remains at the same length, then an increase in the number of workers employed from 10 million to 15 million gives a social working day of 150 million hours. If out of the 100 million hours new value produced by labour, in the social working-day 40 million were required to reproduce this labour-power, then the rate of surplus value is 150%. If, social productivity rises, which is the necessary condition for a rising organic composition of capital, and for the LTRPF, then we might expect that when the social working-day rises to 150 million hours, as more workers are employed that the amount of social labour-time required to reproduce this greater quantity of labour-power, might remain just 40 million hours, or even fall. In that case, we would have a rate of surplus value of 275%. 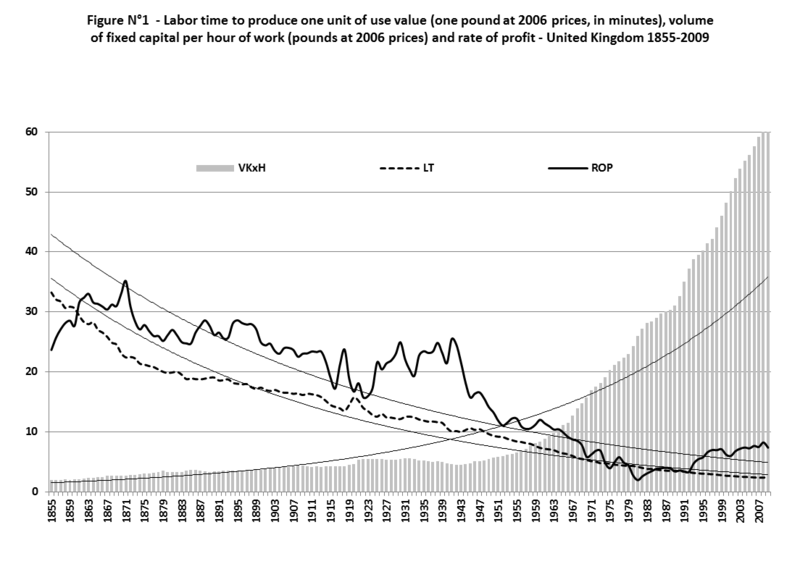 As Marx says, a further condition for the LTRPF, is that this rising social productivity results in an increase in the mass of surplus value, and this increased mass then enables more capital to be accumulated, and more labour to be employed – this is particularly the case, as the rising social productivity cheapness both constant and variable capital, releasing capital for additional accumulation. That is why for the last 250 plus years we have seen a huge increase in the size of the working-class, and level of employment. In that case there is no reason that the length of the social working-day cannot rise to any dimension, whilst the amount of necessary labour-time required for its reproduction would remain constant or even fall. For example, this process of accumulation and increase in the length of the social working-day might result in 1 billion workers being employed, whilst the labour-time required for its reproduction remains 40 million hours. In that case, the social working-day would be 10 billion hours long, necessary labour-time is 40 million hours, and surplus labour-time is 9 billion, 960 million hours. That gives a rate of surplus value of 24,900%. In fact, the length of the social working day has no upper limit, and the portion of the social working day required as necessary labour only has a lower limit of zero. Its one reason the perrennial predictions of the catastrophists of mass unemployment, falling masses of profits and so on, always fail to materialise. I agree that historical data must be used to test theory. But methodology is critical and hence there isn’t consensus on movements in the ROP. Is there such a thing as a measurable ‘Marxist Rate of Profit’? Even if one doesn’t accept Heinrich on Marx’s ‘break’ with the TROPF, the descriptive language employed on the impact of the countervailing tendencies is fluffy at times. I’m not quite so sure that consensus is the issue. We are, after all, talking about Marxism, and Marxists where consensus, agreement, etc. is a “low value” product at best, and a fool’s errand at worst, if you catch my drift. I agree that we need to examine the methodology of the presentations on the rate of profit– and determine from that if there are inconsistencies, omissions (or inclusions), that skew the trend– but after all we are talking about a trend, so as long as the same categories of “variables” are accessed to provide the data for the computation, and such variables are reasonable proxies for C, c, v, s, p, k, etc., we can develop a certain confidence based on the consistency and the convergence of the results of the different methodologies. That being said, it is important to remember that Marx’s emphasis is on the law of the tendency of the rate of profit to decline and its significance not as an impending “death knell” of capitalism, but as a limit to capitalist accumulation– where wealth and value diverge– a limit that precipitates the strenuous efforts to overcome the decline and leads us FROM economics and TO the relations of classes, to class struggle. In Theories of Surplus Value Part II, in analysing and critiquing Ricardo’s theory of crisis, Marx points out that Ricardo could not possibly understand capitalist crises, as crises of overproduction, because Ricardo had never seen one. The crises that Ricardo witnessed, Marx goes on, were the financial crises of the 18th century, in which banks issued their own money tokens to excess, leading to a run on the Bank, or else to other financial crises and panics such as the South Sea Bubble. Crises of overproduction only start according to Marx and Engels with the crisis of 1825, and the obvious change here from the capitalism of the preceding 400 years, is the fact that by 1825, production had become machine production, and expanded on a prodigious scale. Marx’s quote in TOSV about the overproduction of yarn being caused by the introduction of spinning machines, and the fact that this overproduction of yarn was overcome only when weaving machines capable of consuming it, is an indication of that. In fact, in TOSV, Marx sets out four potential causes of crises that are inherent not just in capitalism, but in all commodity production and exchange, as I have set out in my book – Marx and Engels’ Theories of Crises. These are the contradiction inherent in the commodity of it being simultaneously a use value and an exchange value, the separation of production from consumption, thirdly is the contradiction between the role of money as means of circulation and means of payment, and finally there is the potential for disproportions arising from varying levels of productivity in different lines of production. In Theories of Surplus Value, Marx sets out how this latter cause of crises arises in all modes of production. The USSR suffered repeated such crises, but Marx in both Capital III, and in Theories of Surplus Value, discusses the way that productivity rises faster in some lines of production than others, so that although the amount of value produced rises by an equal amount in both cases, the amount of use values produced can vary significantly, so that the output of one can no longer find a market from being exchanged with the output of the other. That situation exists almost permanently, also, as Marx sets out in Capital II, in relation to the need to replace fixed capital only gradually, whilst its value is constantly transferred to the value of final output, and realised by the producers of Department II commodities, as available money-capital that must be hoarded. Incidentally, Marx’s insistence here on a condition of simple reproduction, where by definition there is no accumulation, and so no change in the organic composition of capital, and so no rising social productivity required for the Law of Falling Profits to operate, and yet a crisis of overproduction arising, itself alone disproves the idea that fundamental to his theory of crisis was the LTRPF. In fact, in Capital II, in analysing the actual causes and outbreaks of crises, Marx again sets out several points within the circuit of industrial capital, where such ruptures may occur, arising from different sets of conditions. In fact, most of these arise from over exuberance, over investment, over trading and so on caused by high levels and rates of profit, rather than the opposite. This indeed is my problem with this “turning over” however insightful. It is the “struggle” that has to be understood and in this respect theory of crisis is of little help if not counterproductive because it easily can lead to an economist view on struggle where one can wait until capitalism collapses by its own contradictions. Such a collapse may come but will most likely produce chaos and relapse to dark ages and not the desired abundance without toil. The main problem of the idea of struggle is that it presupposes subjects, intentional organizations, most likely “the bourgeoisie” vs “the proletariat”. The existence of such subjects is rather problematic these days, especially the latter one. The Bilderberg Conference and the Davos Economic Forum could be seen as some “bourgeois” subject. A counterpart on the necessary global scale simply doesn’t exist and I think it very unlikely that it will somehow come into being as an organization of the deprived and (mass) labor. So the assumption here is that all the labor employed is productive labor? Capitalism, in the classical sense, is based on competing capitals. It is the process of capital accumulation itself that creates monopolies and cartels. That is, capital is true to its nature, it undermines itself. We see then, that the process of capital accumulation not only brings monopoly but it brings continual transformation of the means of production, i.e. continual transformation of the capitalist mode of production. That is, the process of capital accumulation brings constant revolutions in techniques of production, which is constant change in the organic composition of capital. Which we already know results in the tendency for the average rate of profit to decline. Everywhere, the well-being of the working class is at the mercy of the uneven process of capital accumulation. The global process of capital accumulation, through the activities of the personifications of capital, the bosses, brings a universal character to all corners of the globe. Globally, the increased productivity of labour, the cheapening of commodities, leads more and more layers of society to participate in the mass consuming society. Once established, capital must sustain the global mass consumer market, i.e. must sustain the potential for growth in the rate of profit. The requirement for increasing the exploitation of labour so that even more commodities are overproduced more cheaply that must be sold in the drive for a higher rate of profit, i.e. the need to create, sustain and expand the global market, the global consumer society..…all of these bring deepening periodic crises to the process of capital accumulation, deepening periodic crises in the realisation of an acceptable rate of profit. The sole purpose of the forces of production in capitalist society is to facilitate the creation of surplus value, M – C – M+, the aim being profit. As capital declines, the relations between the classes become polarised and irreconcilable. The struggle within a disintegrating society, will be decided by the increasingly aware majority. A rational majority who will, increasingly, recognise the necessity of freeing labour, that is, itself, from the yoke of capital. As capital increasingly malfunctions, driven by the very process of capital accumulation, we see an unfolding of the basic contradiction between the social forces of production and existing capitalist social relations of production. within my ebook ‘Marx: Capitalism No Future’ the reader discovers the process that IS the exploitation of the working class. Discovers what determines the relations of dominance and servitude in capitalist society. The consciousness of the universal class, the working class, is evolving. It is the job of socialists to educate the working class. TRPF no doubt interesting but not crucial. For many decades many socialists have put the needs of the working class on the back-burner. It is the sole job of all socialists to educate the working class. Marx has provided us with the scientific analysis that the working class requires. Amazingly, many socialists are completely at home within bourgeois academia. These socialists may not all be French, but they do explain why Marx said that he was not a Marxist. The categories that Marx uses do not map directly to the empirical, appearance only data and statistics used in bourgeois economics. The bourgeoisie just love to see some so-called socialists almost completely ignore the needs of the working class by offering analysis that poses absolutely no threat to the rule of the capitalist class. Shameful. Why does capitalism work better than communism? When I was 12 I thought communism worked, and that capitalism was inefficient and incoherent. I believed that you needed one person or government in command to decide what direction the country or world should go. But I now realise I was wrong to believe communism was the system that made most sense. My philosophy was that it would be like comparing having 1 car driver rather than 10 car drivers. Too many cooks spoil the broth. Someone all powerful needed to be in command to decide what we should all do. a) More competition of ideas. To decide what the best idea is. If you have one man or woman in command and then they take the country in the wrong direction, then with a central system there is no way back. b) Survival of thee fittest. Competition of products and companies. The best products in terms pf price and quality will defeat the products that fail. c) The customer decides not the producer. Obviously a system where the customer decides what is the best product rather than a system where someone high up in society making the product decides Automatically what product is best for perosn. d) The liquid or bee versus the solid. I have this ideas that in a capitalist society the ideas will spill over the world and fill every need needed. While the communist system would be like a solid block all focussing on only the areas that the all powerful command structure thinks is best to fill. e) There is not one all powerful human who knows better than all of us what the country needs to do. Boris Yeltsin used to complain in Gorbachov’s cabinet that Gorbachov was not open to other peoples ideas. He used to say why would you get a cabinet of the most intelligent people in the Soviet Union and not allow them to put their view forward. This is true on a larger scale. There is not one all powerful person or group of people who know what is best for every one of us. We should be free to decide our own lives. We know what we need. f) Freedom to live your life, the way you want. We should be free to decide what is best for our lives not have our lives imposed on us by some all powerful central or region command structure. If you give power to one person or group of people then they are likely to be corrupted by that power and give themselves or their locality all the wealth and power. I still think there should be taxes to redistribute wealth to ensure there is no poverty, food shortage, and there are sometimes corruptions of the market, or areas where capitalism has failed to invest in. We need to find education, public services, and housing. To ensure everyone has a decent standard of living. But capitalism give us freedom and gives the customer power.